I keep beating myself up with self-recriminations. Why didn’t I read the signals clearly and get help for Titanoman earlier? It began after we gave him a bit too little food with his morning Augmentin on Wednesday. He walking into another space from his bowls and vomited. He repeated vomiting until it was dry heaves in the vet’s office in the early afternoon. An exam, more blood drawn and a hypothesis: his stomach was upset by the powerful anti-biotic. But he needed to calm things down so that he could continue the Augmentin, the supplement which protects the liver, the prednisone and if he had any pain, the combo of Tramadol and Gabapentin. He needed all that to keep the lymphoma at bay and keep his blood count normal. He needed all that with this his third chemo protocol, the “rescue” chemotherapy, to give him maybe another two to six months, outside, to live. And on Wednesday he refused to take any medications or eat any food after the regurgitation spasms. He had been given a shot of Cerenia and it helped with nausea, but something else was going on: not eating and hobbling on the left rear leg. The vet said take him home and let’s see if the Augmentin’s absence and the anti nausea med does the trick. By mid afternoon he was having troubles getting up and walking. We were at wits’ end about what to do until we found that our former vet here in our new hometown offered home care! Unbelievable. Nobody offers home care any more as a routine part of a medical or vet medical practice. But she does. And she did. He verdict was: probably his spine. Lets give him Gabapentin by mouth, Prednisocw by mouth, more Cerenia and then morphine just to be sure. And if he cannot or will not get up after the morphine wears off around 11 PM, then tomorrow we will have to end his agony and life: euthanasia. He stood by himself twice between 11 PM and 3 am today. By 3 am he could not stand unless we hoisted him in the Help ‘Em Up Harness which Bruno had and which the vet and vet tech had helped us get onto him. Otherwise he was struggling with episodes of heavy paying and open mouth breathing while on his side in the hall, struggling to try to move himself, failing back into exhaustion and not getting up. At 3 we realize that we need help, even if it is for a euthanasia. (Large, hard lump in my throat, nerves screaming, mind whirling, fatigue pushing me hard but not overtaking me). The Emergency Vet Hospital 15 minutes away says get him here. We haul and hoist him into the Outback “trunk” area on top of an old, soft deep comforter. He smiles the car is one of his homes. He is safe. By 4:30 we are there. This loss is especially hard for Nancy: Titan was one of the greatest loves of her life. She and he were, are and always will be one. that is a once in a lifetime inimitable gift. Precisely that, however, insures that she will feel even more sharply the aching emptiness of the hole beside snd inside herself where he used to be, while the healing process of grief takes its course. As for me, as I write I am quietly rehearsing my habitual though basec on his being nesrby: “come here bud, lets play tug the ball”. In that very instant Inrealize with a feeling of almost nauseating bottomless falling, that his physical being cannot do that any more. 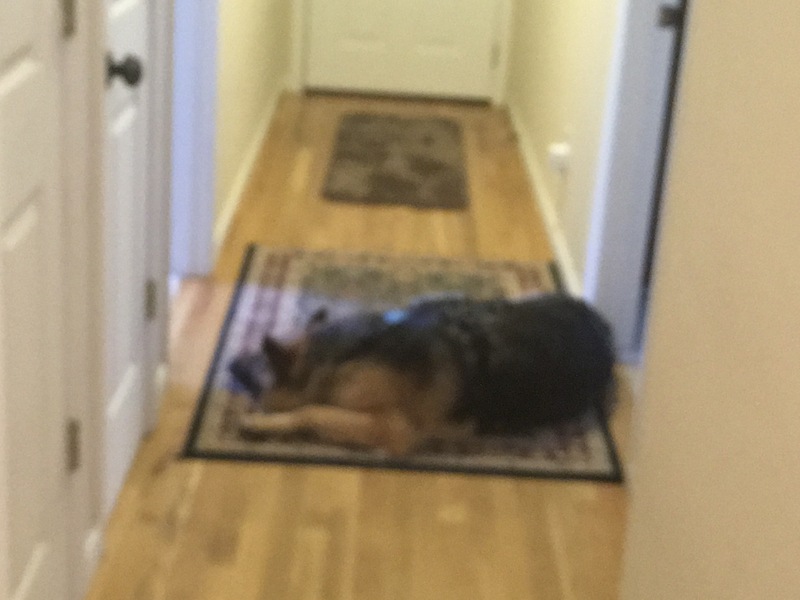 Then I’m knocked down by the very big disaster for me, on older fellow who found his only effective cure for lifelong very severe ADHD in the companionship not just of dogs, but especially and powerfully with trained GSDs. The big knock down is realization.that for the first time in 17 years there is no GSD awaiting us at home when we return is daunting. It ties up my gut in fear. Ut at least helping him with his dying we got right in the end. We are so very very glad that he died while in the hospital; we took him there because we could not handle his struggle by ourselves. And we wanted him and his body to be treated with the utmost care and dignity. Things got so unbearably painful for him and us that night. We filled God’s inbox with prayers, petitions, even outright commands in less than civil language. With just an bour left for him, We achieved that at nearby Western Carolina Regional Animal and Emergency just in time. We are so utterly grateful for the unconditional love he brought us — just as Bruno,Zora and Kaiser did. 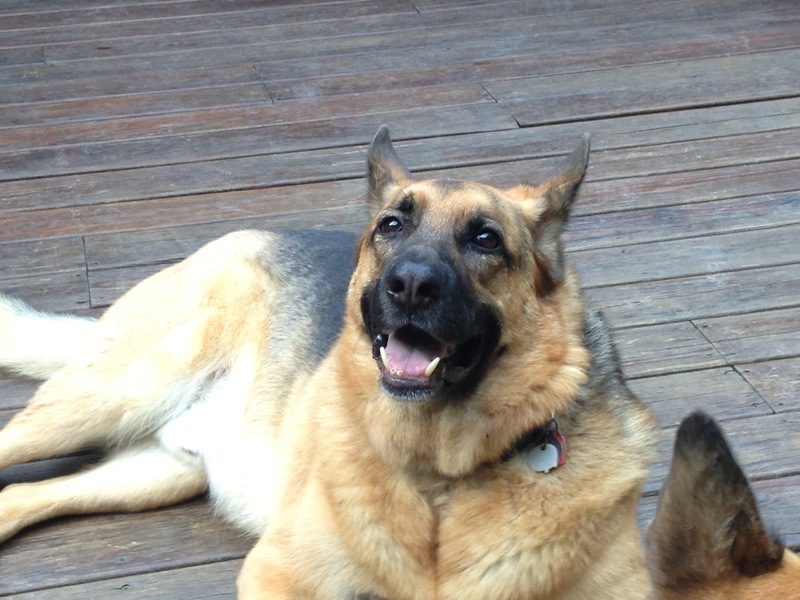 We are grateful to German Shepherd Rescue and Adoption of NC for having brought Titan and Kaiser to us. Our GSD companions have lined our lived for 18 years with safety, steadiness, solace and sweetly intelligent companionship. Titan came to us on the 19th of April, 2013 via Connie from German Shepherd Rescue and Adoption, a group of some of the most loving and tough people I’ve ever known. It takes a lot to have to face a dog whom some dead-souled human starved, intimidated, kicked in 3 ribs and knocked out a tooth while scarring his muzzle and psyche — all before dumping in the woods to die? Is that love exceeded anywhere? That’s what happened to Titan and the context in which he had lived when I fist met him at GSRA’s Adoption Event in March, 2013 in Cary. We know who did it from what he feared when he came to us: a slim person, wearing dark shoes or especially boots, jeans or especially cargo pants and a baseball cap,. We think this person, if such a lowlife can deserve the appellation of human implied in the word person, must have been a male: titan was terrified of me, cowering, baring fangs, growling at first. We think he was protected by a woman–he had no fear of any woman who is comfortable around him. And in some way the back seat or utility area in the back ofd an SUV type vehicle was his safe haven: even dying, one hour before his body gave out, you could see the realization and joy at being in the back of our Outback–regardless of going to his final vet visit. He became noticeably more agitated at the vet hospital. It was hard to draw blood because it was thickening inside his veins. He began to breath with his mouth wide open, tongue hanging out, long, loose, pink in color but dry as a bone and oozing a sweet-rotten smelling green nd black gelatinous goo which had to be wiped from his lip: dehydrated saliva. He was alternately restless and almost senseless. The vet was in a hurry to get his blood tested. Maybe there was something that could still be done. The vet had sprinted with the blood to the testing area at about 5:15 am. He’d given T an injection of painkiller to slow the stress on the heart and lungs. Nancy was talking to him – T – and turned to do something at the counter in the exam room. I was sitting a bit away and behind where Nancy was standing. The instant she turned away, he raised his head, looking for a split second up towards the corner ceiling in the room to his front and left. He had not been able to raise his head or even react for hours now. And now suddenly he sits up? But that’s not even the half of what I saw and cannot explain. Just before Nancy had turned around, I had noticed that, lying there on his side, panting, those deep, large brown eyes had begun to shine a glazedgolden brown . Suddenly the great bear head raises up, just as if he were at home and had heard something outside that was not supposed to have been there: high alert. It was as if he’d seen something beyond that room. But his alert was suddenly ecstatic. We all know what our dog looks like when he is overjoyed to see someone he loves. Those golden brown eyes the instant he showed his joy glowed molten gold.And then, the golden light just stopped and he slumped slowly, head first and neck curved, as he’d been doing when tired from exertion all night to his right. My eyes went instantly to his abdomen: the lifting and falling of life was gone. He was dead. I had seen something that we just do not get to see on this earth. Please don’t ask me to prove it — you were not there, I was. It overwhelmed me, I knew biblical awe in a flash, but my mind was kicking on my thoughts saying, tell her, tell her. God I did not want to tell her that but I did. She screamed for the vet — but more for her loss, and he came running. No heartbeat. Just a very very handsome boy lying there, eyes open but with a gentle far away stare, those large black coal nugget eyes that always had had that polish and questioning look, were dull and blank.. I am editing this on October 23. My oh my how that hole in my life still aches, how that empty hall still hangs dark with shadows of his suffering and last nights struggle. I’d do anything to get him — and Kaiser, and bruno and Zora — back. But I digress. The blood tests showed that his kidneys had failed. We were right in deciding not to do resuscitation. So it would not have made one iota of difference whether we had gone there earlier or not. He was on his way out all during those two days. He was trying to tell us that by not eating. He was trying to get, not to the hospital, but back into the car. At least just about his last experience was a 15 minute car ride. He wanted to leave from his safe place. Of course now we are enduing the wrenching and lurching agony of separation, parting with no debrief afterwards. We are doing all the phases of grief. But they say that the brain remains active for a period after the heart stops. I am so utterly grateful that that night shift vet gave us 10 minutes with him and then promised dignified and caring treatment of his body. Indeed when he came back, he sat down in front of T, told him how handsome he was, and stroked his head, neck, legs and sides. But in those 10 minutes, when I now believe his true eternal self had made those eyes glow and was still gently hanging on to this world, he heard, saw, felt and knew a love song enough to break the bonds of death itself. The miracle was that we wound up doing it all just right. Or more accurately: we were guided by him to take all the right actions at all the right times. We are devoted to German Shepherds and after a pause to grieve and reorient ourselves, not only want to bring more into our lives. We feel strongly that we must do that, that it is our lot in this life to provide a home and a good life for GSDs misunderstood as “aggressive”, rejected, dumped, abandoned, beaten, starved and worst of all, ignored. We owe it to Bruno, Zora, Kaiser, Titan. Having our hand out for them is our responsibility. Thank God he chose Nancy for his earthly commitment. Thank God that we had the honor and sublime joy of having been his companions for four years. Thank God that we gave him in return the best life we could. Thank you Titan for having given me just a quick glimpse of whatever it is that animates all life. Thank God for Titan and German Shepherds.